Hi true believers. I'm George. I've been into what is commonly known as tabletop gaming for about 2 years. That's not to say I never played a board game before that. I've always loved games. I've just never been any good at them. However, I love stuff and social interaction and board games provide both in troves. Back when Game of Thrones was in it's 2nd season (I think) my friends and I noticed there was a Game of Thrones board game (based on the book). We were all like "awesome!". It was super complicated, with a heavy-set rulebook that made no sense at first, but once we got into it we were hooked. A couple of months into my subsequent board gaming obsession, I watched the first series of the sublime game-orientated sit-com on YouTube 'Board With Life' (See what they did there?!) by Moonrat Media. It was brilliantly scripted and all based around a hobby that I was falling for, hard. They're currently working on their 2nd series now but they're filling the time by doing short sketches and news segments about board game releases and the like. It was in one of these segments recently that I heard Christopher Bryan mention he was undertaking the '51 in 15' challenge, to play 51 unique tabletop games in 2015. And right here in post number 1, I'd like to tell you about the first couple of games I've played in this fine, juvenile year. Do you enjoy telling bare-faced lies to your nearest and dearest? Do you take any opportunity to make sure the future of your loved ones is miserable? Are you unnaturally obsessed with popping the buttons on a denim shirt? 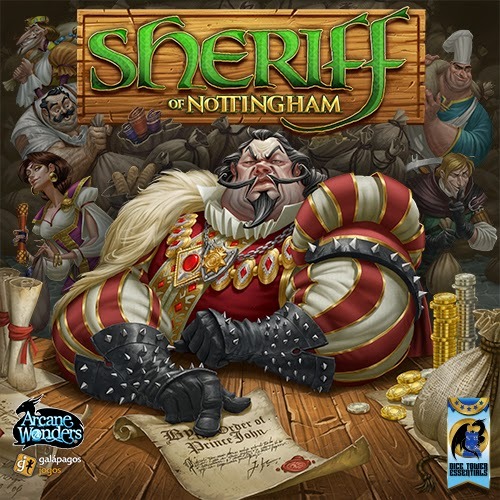 Then you'll love Sheriff of Nottingham by Arcane Wonders. This game has gone by a few different monikers but this is the first I've tried. Arcane Wonders also produced Mage Wars which is a super fun 2-player game of...duelling mages! Each player has a small velvety pouch (with the aforementioned buttons, which are weirdly fun to pop) that they are stuffing with cards that represent goods they are trying to bring to market. Some are perfectly innocent such as bread and juicy apples however some are contraband that could get you in quite the spot of bother such as luxury cheese and everyone's favourite delicious appetizer, crossbows? Players take it in turns to be (you guessed it) the Sheriff of Nottingham, inspecting everyone's bags before they get to market. Each player claims what they're bringing to market (such as 3 bread) and if the sheriff thinks you're telling the God's honest, he'll let you go about your business. However, if he thinks you're telling porkies, well, then you've gotta cough up. Ooh De Lally! This is a great, relatively short filler that has some juicy moments of tensions and a barrel full of laughs, seeing your friends beg and plead for their livelihood is a particular highlight. A great start to and epic year of gaming. The lovely lot at Board With Life have actually done a super and hilarious play-through on the YouTubes. Wow this game is so much fun. So much fun in fact that it took up an entire Saturday of my wife Winny and I's this past week. Granted, we were mega jet-lagged so we didn't actually rise until about 1pm, but the rest of the Staurday? Arcadia Questing! This game popped up on the alter of money-sucking wonderments Kickstarter about a year ago and at the time it just wasn't possible for me to dive in. I regretted it every day since what with all the tantalising vidyas on that there YouTube dripping through these past few months. It seemed to take forever to reach our shores but the second it did, I was there. It has totally lived up to my expectations. Cool Mini or Not are an outstanding publisher when it comes to components and overall presentation of their games. They're produced some much loved favourites of mine thus far such as Zombicide and Kaosball. 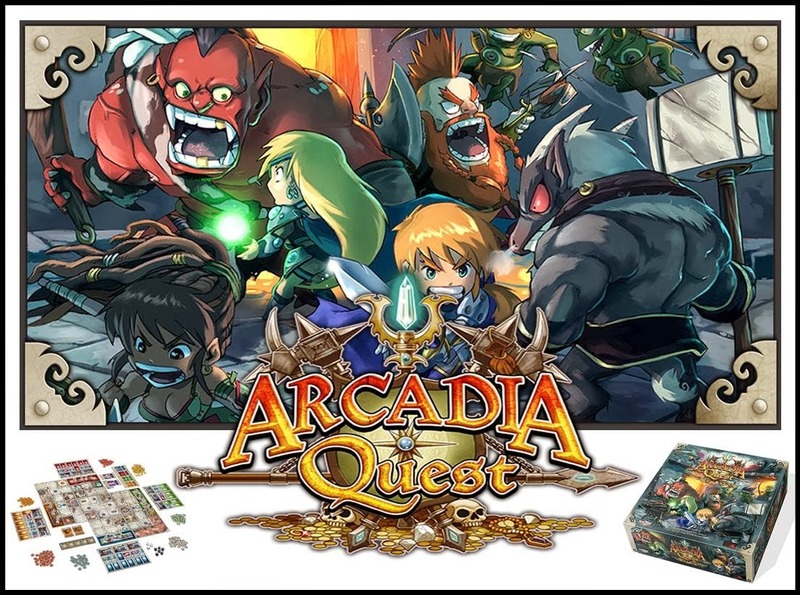 Arcadia Quest is a 2-4 player game that acts kinda like a dungeon crawler and kinda like a skirmish game. It's campaign led with various scenarios where you're playing against the game and each other. It's set in the fictional city of Arcadia which has been overrun by Orcs, Goblins and Trolls that are being manipulated by the evil vampire Lord Fang! Your each play proud guilds attempting to reclaim the city and to have the most influence with the King once it is taken. One of my favourite things about this game is the dice mechanic. When you're fighting a hero or a monster you're making either a ranged or melee attack, both of which are symbols of the custom 6-sided dice. However, the dice also have a CRIT symbol which counts as a ht for either attack but also means you et to roll another die! Giggling and valiant acts of heroism ensue. If you'd like a much better example of how the game is played you should definitely go check out Rodney Smith's channel Watch It Played on the YouTubes. Go and play this game. You will not regret the Saturday afternoon you lose, I mean happily pass along, to it.